Reviving a custom that faded in the early 1970s, members of Saint Tikhon’s Seminary’s Class of 2013 gathered before the monastery bell tower for commencement exercises on Saturday, May 25, 2013. According to Abbot Sergius, the seminary’s Interim Dean, fifteen graduates received Master of Divinity degrees, four received certificates in Diaconal Formation, and one received a certificate in Priestly Formation. Joining the seminary’s President, Metropolitan Tikhon, on the belltower steps were Metropolitan Herman, retired; Archbishop Justinian of Naro-Fominsk, Administrator of the Patriarchal Parishes in the USA; Archbishop Benjamin of San Francisco; Bishop Michael of New York; Bishop Mark of Baltimore; Archpriest John Jillions, OCA Chancellor; Abbot Sergius; and members of the seminary’s Board of Trustees and Faculty. Archbishop Justinian conveyed the blessing of and greetings from His Holiness, Patriarch Kirill of Moscow, and presented an icon to the seminary community on his behalf. Archpriest Daniel Donlick, Dean Emeritus, delivered a stirring commencement address, “Remembering the Past for the Future.” Father Daniel’s life for countless years was devoted to the development and growth of the seminary—a major undertaking in addition to his parish and teaching duties. While offering encouragement to the graduates as they face their futures, he urged them to remember the past, in which the future is rooted and wherein it will bear fruit in the vineyard of Our Lord. Simona Irime, the first female recipient of the Master of Divinity degree at Saint Tikhon’s Seminary, delivered a moving Valedictorian Address. Paul Chernay was awarded an Honorary Doctorate, Humane Letters, added Father Sergius. Later in the day, Archpriest John Kowalczyk and the faithful of Saint Michael Church, Jermyn, PA, hosted the the hierarchs, the graduates and their families and friends, faculty members, and clergy and faithful from throughout the region. 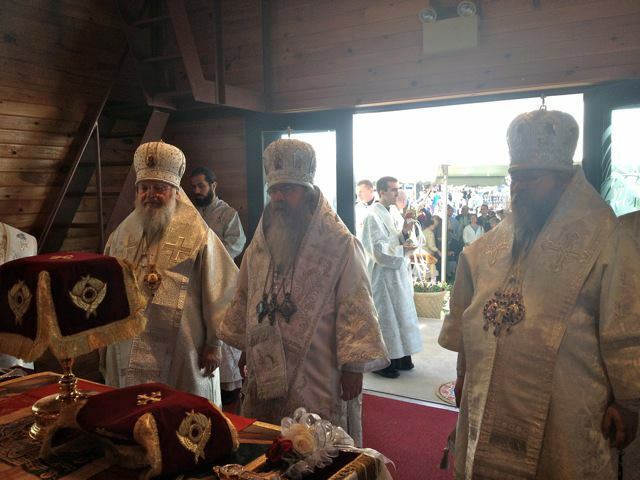 The commencement took place in conjunction with the 109th annual Pilgrimage to Saint Tikhon’s Monastery. From the moment the Pilgrimage officially opened on Friday afternoon, May 24, a steady stream of pilgrims passed under the monastery’s entrance arch to pray, worship, venerate the wonderworking icon of Saint Anna that was present throughout the pilgrimage, and engage in fellowship. Memorials were celebrated in the monastery cemetery throughout the weekend. In the revival of another custom that had faded in the 1980s, the Hierarchical Divine Liturgy was celebrated at the monastery bell tower, rather than the pavilion, on Memorial Day, Monday, May 27. Concelebrating with Metropolitan Tikhon were Metropolitan Jonah; Metropolitan Hilarion, First Hierarch of the Russian Orthodox Church Outside of Russia; Archbishop Benjamin; Bishop Melchizedek of Pittsburgh; Bishop Michael; and Bishop Mark. At the conclusion of the Divine Liturgy, Metropolitan Tikhon presented a Synodal Grammota to Archpriest John Perich in recognition of his countless contributions to the life of the OCA, including among other accomplishments the development of the museum of the history of Orthodoxy in America at Saint Tikhon’s and, most recently, for serving as Temporary Administrator of Saint Nicholas Cathedral, Washington, DC. Detailed information on and impressions of the Pilgrimage and commencement weekend, written by Father John Jillions, may be found here.